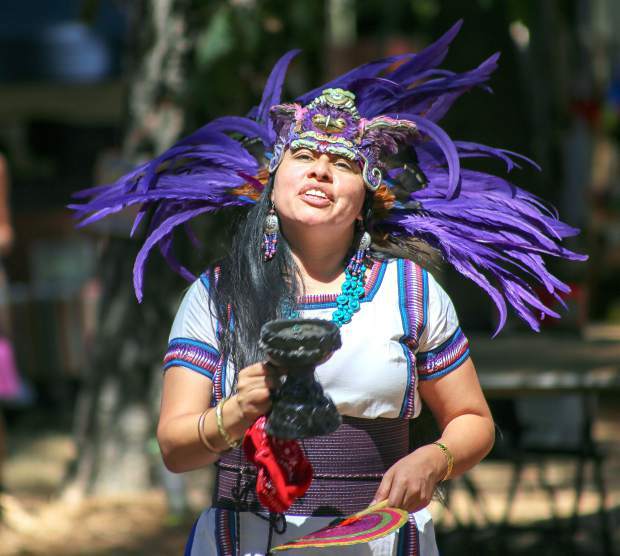 The Southern California Aztec Dancers performed at WorldFest last year and are back this year as well. While WordFest celebrates its 20th anniversary this year, the Global Indigenous Peoples Village within the world music festival is celebrating a milestone of its own. For eight years, the village has been conducting performances inside of WorldFest, within its own area. Now, with the help of a grant and increased interest, the program is expanding and taking a more prominent role in the festival’s activities. The Global Indigenous Peoples Village was created in 2008, and known as the Native People’s Village. The name change is new, to help symbolize its growth and to indicate that it truly is a global event, not just a local one. Mignon Geli, a co-coordinator of the village along with Ann Kastner, has been involved with the village since its inception. In its first year, Geli performed with flute band Loping Wolf before signing up as a volunteer. Geli detailed growing pains over the years, including the inability to pay performers. Geli herself was not given compensation; instead, Kastner would give Geli half of the stipend she received. It was not until after the Center for the Arts purchased WorldFest in 2014 that she was added to the payroll. The festival’s acquisition by the Center for the Arts proved to be a boon for the Native People’s Village. Executive Director Julie Baker says they were immediately interested in providing assistance to Kastner and Geli. “They had essentially been programming both traditional native tribes coming in and doing dance and musical performances, as well as artisans and storytellers,” Baker said. “They were almost doing it on their own. In a sense, it was a festival within a festival when we inherited WorldFest. The Global Village’s expansion includes a new stage. Once known as the Oak Grove Stage but now renamed the Global Stage, this new space gives Kastner and Geli an opportunity to have a full, three-day schedule. “Instead of having a small area for the village and a regular stage right next to it, we’ve expanded it to be the Global Village. Now they have a stage, a lounge and the area where there’s dancing, artisans and performances,” Baker said. The Global Village will begin with an opening ceremony at 9 a.m. Friday, July 15. Notable acts will include Sihasin, a band that mixes Native, rock, punk, and world music; Earth Guardians, an eco hip-hop group led by 15-year-old Xiuhtezcatl Martinez, and much more. A full schedule of the events taking place on Friday, Saturday and Sunday can be found at http://worldfest.net/global-indigenous-peoples-village/. Another new idea to come out of the village’s expansion, says Baker, is an indigenous music jam that will take place at 3 p.m. on the Global Stage each of the three days. Spencer Kellar is a freelance writer living in Nevada City; he can be reached at spencerkellar@gmail.com.